Over the last couple of years, I have loved seeing deep, rich wall paint colors coming through my feeds. Today, the crew is painting an accent wall in Sherwin Williams’ beautiful Waterloo – a dusty blue-gray – and it has inspired me to share some of my favorite blue looks from around the web (thank you, Pinterest). Emily Henderson offers lots of inspiration her uniquely laid-back-yet-pulled-together style. Her most recent reveal is her own house that she staged for sale using blue as a core color component. She took a more conservative approach that even a timid blue newbie (blue-bie?) could get excited about as it mostly relies on accessories to get the look (at least in this room). 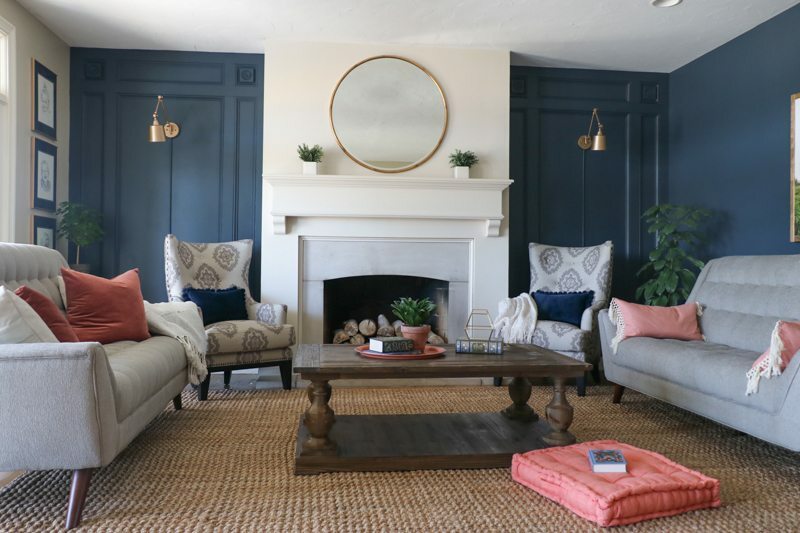 Touches of blue in this living room from Emily Henderson’s blog. Going a bit deeper, this next example from Design Sponge highlights how this family punched up color in this VERY old farm house. It happens to look a lot like our actual kitchen, so I have saved this one for myself. I like the idea of just the fireplace because it makes a statement but if it doesn’t work, it won’t be hard to change back. Historic features accented with a pop of color that seems right at home from Design Sponge. Transformation in blue! from Sincerely Sara D.
This bedroom is actually just the accent wall behind the headboard, but I think it could go all the way. What do you think? And finally, an office that makes me want to work by…Emily Henderson. I told you she likes the blue. I just love this moody mod space and the balance the art, plants, and leather bring to it. Check out the post as there are many, many pictures to inspire. All the way blue modern office by Emily Henderson. Other colors come and go but navy is forever. Thinking about diving in deep with blue? Share your inspiration, RVA!